Our Restaurant and cafe Bar are at your service with an a La Carte men� including breakfast lunch and dinner. 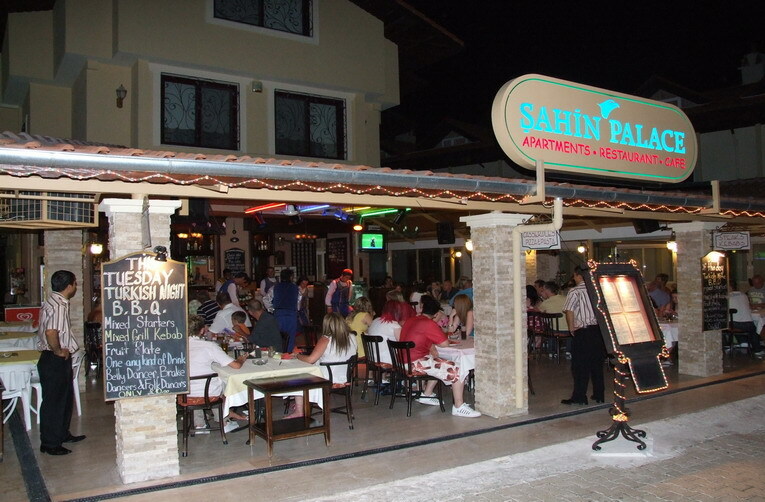 The restaurant is open to guests staying in the apartments and also guests from outside. All of our staff are highly efficient and offer a clean and friendly atmosphere. Food and beverages are fresh on a daily basis,prepared under very hygenic conditions. Our Chef would welcome you into his kitchen. The choice of food is varied to suit all tastes, you can try: Turkish, Italian, French, British, Chinese and Ottoman which all feature on our menu. We also recommend you to try our oregional special sea food, selected Turkish wines, cocktails and Mrs �ahin's home made cakes and gateaux. Once you have wined and dined you can share your enjoyment and have a dance with us. Once a week we have a Traditional Turkish Night with plenty of food,drinks and entertainment. If you have a special day to celebrate i.e. Birtday, Anniversary or Engagement just let us know. We can organise a special meal, lovely flowers, cakes and gateaux, champagne or wine. "Nothing is too much trouble for our guests." Don�t forget! � �ahin Palace Apartments are ; Your home in ��meler�. See you soon.